Onstream Meetings is an integrated suite that enables businesses to schedule and manage online meetings with their team, colleagues, and clients. User-friendly and cost-effective, Onstream Meetings has been recognized by several software experts and industry leaders as one of the best online meeting tools today. Designed to serve small enterprises and large businesses alike, users can maximize its extensive feature set to present information, collaborate on projects, deliver reports and even set impromptu meetings in an instant. The layout is customizable, allowing users to present the screen based on their business requirements and personal preference. Onstream Meetings can also provide in-depth information on attendance. Basically, users can easily determine who attended and how long they stayed. Whether you are presenting video, sharing information or engaging in collaborative efforts, Onstream Meetings make all that a tad easier. Total control of the webinar process. Users have the helm from preparation to realization. From sending invitations, emailing reminders, collecting registrations, recording the meeting, and delivering follow-up communications. Experience meeting with team members and colleagues on a global scale with desktop and mobile applications. The tool is an ideal platform for boosting lead generation, analyzing PR and analyst relations, marketing operations, and customer training among others. Simple and user-friendly interface makes Onstream Meetings a breeze to use. It is also protected with high-end security measure including end-to-end, 128-bit encryption; unique participant links and password protection. Everything is in the cloud. Users are no longer needed to purchase hardware or install software. Save money. Save time. Since each company has unique business wants, it is sensible for them to abstain from looking for a one-size-fits-all perfect software application. Needless to say, it would be pointless to try to find such an app even among widely used software platforms. The intelligent thing to do would be to list the various essential aspects that need consideration such as main features, finances, skill levels of workers, company size etc. Then, you should do your groundwork thoroughly. Read some Onstream Meetings reviews and investigate each of the other systems in your shortlist in detail. Such exhaustive homework can ensure you weed out ill-fitting systems and zero in on the app that offers all the aspects you need for business success. 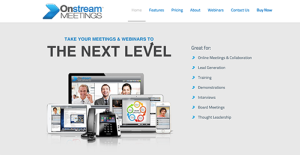 How Much Does Onstream Meetings Cost? We realize that when you make a decision to buy Communications Software it’s important not only to see how experts evaluate it in their reviews, but also to find out if the real people and companies that buy it are actually satisfied with the product. That’s why we’ve created our behavior-based Customer Satisfaction Algorithm™ that gathers customer reviews, comments and Onstream Meetings reviews across a wide range of social media sites. The data is then presented in an easy to digest form showing how many people had positive and negative experience with Onstream Meetings. With that information at hand you should be equipped to make an informed buying decision that you won’t regret. What are Onstream Meetings pricing details? What integrations are available for Onstream Meetings? If you need more information about Onstream Meetings or you simply have a question let us know what you need and we’ll forward your request directly to the vendor.